Here on December 24th — Christmas Eve — 2015, The Legal Genealogist is in awe. But if there was one thing that was driven home, powerfully, when Family Tree DNA stepped up to the plate and went along with my idea to offer free DNA testing to some folks who couldn’t otherwise afford it,1 it’s the fact that there are so many people out there for whom that certainty is lacking. So many people, struggling every day just to keep putting one foot in front of the other. So many people, burning to know more about themselves, but without any realistic way to get that information. So many people, desperate to give to others in their families, and without the means to do so. The stories are all like that. Dozens upon dozens of them, from all over the world. All heart-wrenching. I started off this email hoping to get a DNA test… I finish it hoping that you only see the deeper far reaching implications of your gift. There may be other people like me who want to honor and remember their ancestors, there may be people who have never known their parents or siblings, there may be people who are at the end of their days, people who want to leave a lasting legacy to their descendants. Your kind and generous gift could benefit so many people, from so many walks of life, with so many heart wrenching stories. I don’t envy your task at picking just three. You were touched enough at the thought of somebody not affording a test, the truth is, you will be giving somebody FAR more than just a little financial boost… you will be giving them hope, strength, love, resolve, power, relief, calm, faith, and you don’t know it yet but you will be giving them LIFE. I hope so. Oh, I hope so. Remember that I asked Family Tree DNA to give me one test kit to give away. Instead, they offered three: one YDNA 37-marker test and two autosomal Family Finder tests. When the giveaway was posted, a donor who wants to remain anonymous stepped up and gave three more autosomal Family Finder test kits. And another anonymous donor kicked in two more autosomal Family Finder tests. That meant that not three but eight people would get test kits. When I found myself unable to decide between three candidates for that one YDNA 37-marker test — Family Tree DNA added a second YDNA kit and an anonymous donor stepped in and donated the third. TEN people getting test kits. The 10 people whose stories you read above. The Board of Directors of the nonprofit organization DNAAdoption, stepped in — without being asked — to offer free how-to-use-DNA classes for every single one of the folks getting these kits. They knew that getting the results is the easy part and understanding them not so easy. So thanks to their generosity, those getting the Family Finder kits will be able to take “The Basics of Autosomal DNA,” and those getting the YDNA kits can take the “Beginner Y-DNA” class. These classes, by the way, aren’t just for adoptees — they’re for everyone (in case you’re looking for a class for yourself!). Ten test kits. Ten free how-to classes. And proof, beyond any question, beyond all doubt, that even where there are struggles, there is strength, and that in the quiet depths of our hearts, we are all winners. Wow! Great job Judy! You are a Christmas angel. These folks are really the angels, Dave — so many of those getting these kits are getting them for someone else. Reading this post this morning absolutely made my day and put me in the Christmas spirit. Thank you for sharing these stories. I am so happy for the generosity of these companies, anonymous donors, and yourself. Merry Christmas, Judy! Wow! Just, wow! I was so excited when I saw you were doing this giveaway and thought about entering. However, I have already done my DNA test and recently bought two more kits for family members to test theirs. So, I thought it not fair to even enter since I knew there were others whose need was so much greater than mine. Reading this brought tears to my eyes. What a wonderful gift you and all the others involved have given to these people who have a “need” to do DNA testing. You have not only touched the hearts of those who are getting the tests, but those just reading about it. I hope that the winners will find some of the answers they are looking for. God bless you, Judy, and all those whose generosity has allowed even more people to be tested. Merry Christmas to you and yours! Great Job – merry christmas to all. Thank you Judy for all you do. Judy, your post makes Christmas brighter for me. On behalf of those who received this wonderful gift, thank you! 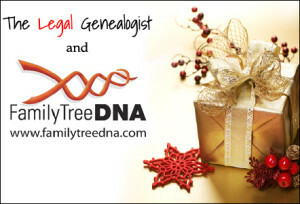 And a big thanks too to Family Tree DNA AND DNAAdoption for joining in! Sobbing, just sobbing. Thank you for your huge heart. And for helping 10 people – families – open up a whole new world. It’s been a sobering and humbling experience for me too, Debi. Thank you for inspiring Family Tree DNA and all the other donors and taking on the responsibility to award these tests. That’s also on behalf of all those who were out there waiting for these people to be tested, all those who will, through these generous gifts, find the matches that connect their families to these ten winters. Thanks for the kind words, and happy holidays to you and yours. This is, Judy, the essence of what Christmas and this time of year is all about. Thank you for your kind-heartedness and continuous giving within our community. I know the implications of these tests will reach far beyond what you could ever imagine. DNA tests give people pieces of their lives, their relatives and their history. There just isn’t a better gift. Great work Judy, FTDNA, DNAAdoption, anonymous donors and all those in need. May the world be a better place with this genorosity. Let the recipients pay it forward howver they can. Happy holidays to all. Merry Christams to those celebrating it. And the very best of the season to you and yours, Kelly! I look forward to the day when the prize winners report back how this gift changed their lives. Thank you Judy for being awesome. Not just me, Karen! So many pitching in here, including the anonymous donors, Family Tree DNA and DNAAdoption.com! This. This right here. This is what it’s all about. Many thanks to you, Judy, and to Family Tree DNA, DNAAdoption & the other folks for contributing to the great spirit of giving. These are the stories that sustain us. Many hugs and much love to all. And the happiest of holidays to you too, Katherine! This makes me happier than if I had won one myself! Merry Christmas to all! And the same to you and yours, Toni! It was thanks to Family Tree DNA and DNAAdoption and anonymous donors too!! This is amazingly sweet and wonderful. Thank you for your generosity for these folks! So many people helped make this happen. It’s heartwarming all around. Wonderful and great giving DNA testing – via yourself, others and sponsors.. giving wonderful gifts over the Christmas and Season of Giving and into the New Year. Congrats, am sure all will welcome this with open arms. Many thanks! Cheers back at ya! Hope your holidays are bright. This is truly a gift of love, but not in the spirit of Christmas, for I am a 2nd generation Jewish American whose ancestral family was torn apart by the Holocaust, and by other mysterious circumstances. My research and the resulting family tree that I’ve built is helping to reassemble the families that my grandparents never mentioned. It turns out that there are more survivors than I expected! I have taken autosomal and mtDNA tests. As a result, I’ve discovered two relatives with my great grandmother’s surname from the same ancestral town in Poland. My great grandmother reputedly had 13 siblings. So far, we’ve been unable to figure out our exact relationship, and existing records have not helped (yet). I have 3 male relatives whose fathers are descended from my great grandfather. I would love yDNA tests for each of them. They can each afford the tests, but have not committed. This summer, I met my mother’s first cousin in Israel. She looks EXACTLY like my aunt did at the same age. The common ancestors are our great grandparents, so there are obviously shared genes that would help identify relatives connected to my great grandmother. These are my examples of the power of DNA testing and matching. I am not asking for financial assistance as there are others whose need is greater. Nonetheless, I wish to commend and thank you and others who have assembled these wonderful gifts. Here’s to results that solve those old family mysteries! What lovely family stories you’re collecting thanks to the power of DNA testing! Good for you! Love it! This has to be one of your top blogs. Puts us all in the Christmas spirit and those winners will be on pins and needles waiting on their tests to get back in 2016. Thanks for all you do Judy. And from the bottom of my heart, thank YOU for being one of the first of our Baker family to test, cousin Stan! It’s because you were one of the pioneers that we know as much about our family as we do — and that makes me hope all these folks can do as well with their test results. Not just me, Wendy!! Spread the credit all around, because it goes to Family Tree DNA, to DNAAdoption and to the anonymous donors too! Judy, thank you for being the ringmaster and creating a venue for helping some deserving folks out! As an adoptee myself, and having tested at all the companies for all their tests over the years, I can say that DNA testing may or may not provide the answers you’re looking for, but it certainly beats not testing! Also, one autosomal test may bear fruit for one person, whereas another would be better for someone else, depending on ancestry and who else is testing where. What’s the best way for myself and others to donate some tests to your runner-ups? Tim, stand by on that, if you would, please… it wouldn’t surprise me to see something come to pass in 2016 that lets us all help others less fortunate than we are — and in a much more organized way! OK, Judy, waiting with bated breath! For anyone interested, purchasing a test or two while the FTDNA holiday sale is on using one of the many discount coupons out there will make your dollar go farther! The pre-purchased test kits can be forwarded on at a later date. Oh how wonderful for those people, Judy! Made me cry that they know could find out very important information about their families and history. All best wishes for an outstanding year in 2016, Judy. It was an amazing experience, Celia — so many people jumping in to help out! I read the Ancestry letter to a good friend who has been thinking about being tested and told her about your recent blog on getting all the older family members tested quickly. She decided to call Ancestry and order kits for herself and her 86 y.o. mother and to join Ancestry, with me helping her get her pedigree online and getting her started in her search. All good!